Multiple tornadoes touched down in Oklahoma on Wednesday, forcing the evacuation of the state’s main commercial airport as a safety precaution. At least one large twister also damaged homes and buildings in the Oklahoma City area. In addition to severe storms and tornadoes, Oklahoma residents had to contend with power outages, golf-ball-sized hail, and flooding. Even wild animals got loose at one town's Tiger Safari wildlife refuge. One of the day’s largest tornadoes, according to local CBS affiliate KWTV, occurred around 4:30 pm local time and resulted in the formation of several satellite twisters. The big storm, whose main tornado measured about a quarter-mile wide, caused damage in Bridge Creek, Blanchard, Norman and Newcastle in the central part of the state. Less than four hours later, another large tornado sprouted from the same storm near Bridge Creek. A daycare center was reportedly struck, but fortunately all the children and staff had already been moved to a shelter. Aerial views of Bridge Creek from local news outlets also show wide swathes of damage from the storm. So far, no injuries have been reported, but 25 buildings were destroyed, according to the Associated Press. Another 10 were destroyed in Amber, some 12 miles west of Bridge Creek. Due to the dangerous weather, the Will Rogers World Airport in Oklahoma City was evacuated as a precaution. Flooding was reported at one of the terminals and people were advised not to drop off or pick up travelers at the airport. In the city of Tuttle, the Tiger Safari animal refuge was struck by a tornado and owners told KFOR that some of the wild creatures had escaped. In addition to tigers, the refuge houses leopards, boa constrictors, alligators and a cheetah. Those living in the area were asked to remain inside of their homes, but police later said all animals had been accounted for. Homes and business were also reported flooded in Moore, about 12 miles south of Oklahoma City, and Tuttle, according to KFOR. Oklahoma City itself was not spared large amounts of rainfall, either. Severe thunderstorm, flash flood and tornado warnings were in effect across numerous counties in the state. More storms may be on the way later this week,, leading experts to urge caution. 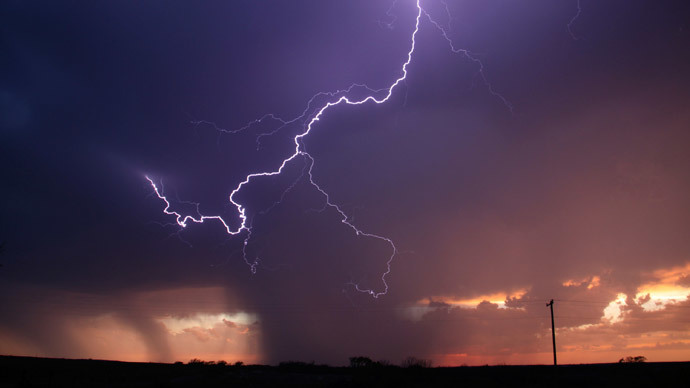 "People just really need to stay weather aware, have a plan and understand that severe storms are possible across portions of the southern Plains almost daily through Saturday," National Weather Service meteorologist Jonathan Kurtz told AP.